This week, I consider the video art projects of Theresa Hak Kyung Cha, who is well-known in the literary community for her hybrid book Dictee but less famous for her other body of work. Born in Korea in 1952, Cha emigrated to the U.S. when she was nine years old, so it is not surprising that much of her art centers on issues of language, voice, identity, and the unsettling or loss of these. She spent her adult life invoking, like prayer, physical representations of silence and disruption; the breadth of her art—spanning written texts, film, slide projections, and performance art—is filled with empty spaces, broken language, and images and terms of silence. In one particular work, Mouth to Mouth (1975), a video recording shows lips slowly mouthing the shapes of Korean vowels, one by one. The mouth comes to the viewer through a haze, gradually appearing amidst a turbulent veil of white noise and then dissolving into it. Aurally we are filled not with the sounds of language but of white noise, water, wind. In this way Cha disrupts the expectation of linguistic meaning and instead offers the viewer a particular sensory, visceral experience. The vowels themselves are “silent,” that is, empty of their phonetically significant sounding; but rather than a mere void, this silence is full of volume and materiality, a grainy weave that shrouds us. The video has a raw quality, enhancing the sense of a throat that is hoarse or ghosted; there are no concrete phonemes or clear articulations for Cha. Instead, Cha “translates” the contents of these vowels by deflecting them: light travels in a straight line, for some, or light breaks, shatters. In this shattering, she opens up a space of uncertain signification, where she is then able to capture a certain textural experience of language—and of the silences that may be contained in it. One might argue that Cha is compelled toward this impulse of dispersion and disintegration in order to represent the experiential reality of an early immigrant. A mouth opens and what can emerge except noise, water, wind? Even a literal loss of a mother tongue (truly, a mother’s tongue) is not a completely empty silence, but rather it is full of splinters and din. It also cradles an emotional immensity—something is left in its imprint, like a hefty shadow. Indeed, language for an immigrant carries more beside its straightforward linguistic or phonemic meaning; it holds memory, homeland, identity, in all their tumult and fragmentation. A refractive way of perceiving, then, takes on a certain urgency for Cha. She is not looking askance merely to name the world anew, but rather she is trying to give representation to the world as she has known it, a reality whose textures and complexities are still rather hidden and unarticulated in mainstream society. Many of Cha’s other films and video projects iterate on these themes of exile and displacement while employing refractive tendencies. In Re Dis Appearing (1977) and Passages/Paysages (1978), Cha sonically overlaps and interjects shards of words and phrases in multiple languages, creating an echoic and fragmentary effect. She evokes this visually by overlaying image stills or juxtaposing slides that disintegrate at varying moments, their contents reflecting and shadowing each other asynchronously. Another project Exilee (1980) replicates the visual effect of refraction by surrounding a video monitor with a film projection, where the two screens present identical image slides and sounds but off-kilter, as one is slightly delayed. Imagery in these projects include: an envelope gradually covered in “white noise” or “snow,” the imprint of an envelope absented, water, ocean, stones, letters, windows, shadows, shadows behind windows, old photographs, open hands, closed hands, clouds, laundry sheets, a tornado. Words and phrases heard aurally and/or seen on screen: she could have been leaving, her shadow, cut out, permanent residence, birthplace, re name, buried, forgotten, absent name, between name, without name, a no name, wounds, exil/e/e. The subjects of these works—lost communications and languages; the liminality of time, space, and identity—are enhanced by the form’s use of echo and uneven layering, which suggest fragmentation, shadow, and ghost. The complexity of identity for an immigrant is relatively unseen, underneath the surface of what is “normal” and “straightforward” in American society. 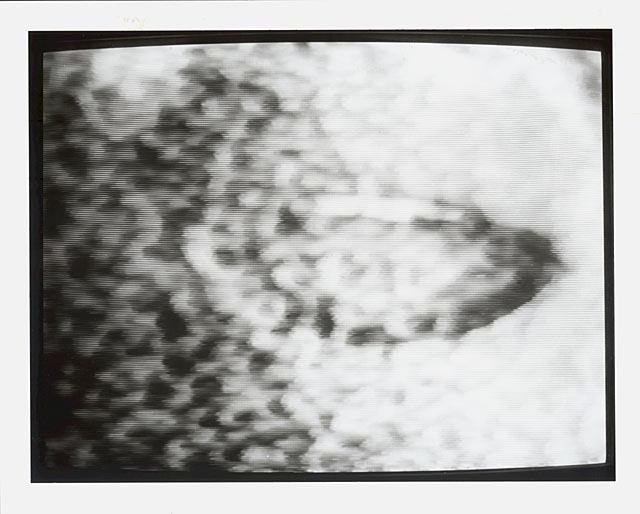 In Cha’s artwork, especially Mouth to Mouth, the rupturing that occurs changes the sound, shape, and grain of what we are observing in a way that reveals the depth and dimensionality of what is inside and underneath its surface appearance—so we see that when one speaks her mother tongue, she is speaking water, din, texture. It is a truth that cannot be expressed literally and can only be understood intuitively at a slant. While Cha was always concerned with the fragmentation of identity, her art implies something more complicated than a self that is simply disintegrated; there is a robustness and substance to the displaced self that disappears and reappears, that is nebulous, imprecise, splintered, haunted. Image stills are from Mouth to Mouth by Theresa Hak Kyung Cha, University of California, Berkeley Art Museum and Pacific Film Archive, 1987. Sitting with the lights off in the tinest room, watching these lights flicker on a screen, was a magical experience. Thank you to BAMPFA.